Cold, dark Winter mornings are definitely not fun at all. Most mornings I just want to crawl back under the covers until a much more sociable time (6am is definitely not sociable by any means). The only thing that will guarantee me to get up out of bed when my alarm goes off at 6am is something exciting for breakfast. Maxinutrition recently got in contact and asked if I would like to try out a new recipe. Being the massive foodie I am, I agreed and selected a breakfast option to try out because quite simply I am rubbish at trying different things for breakfast. 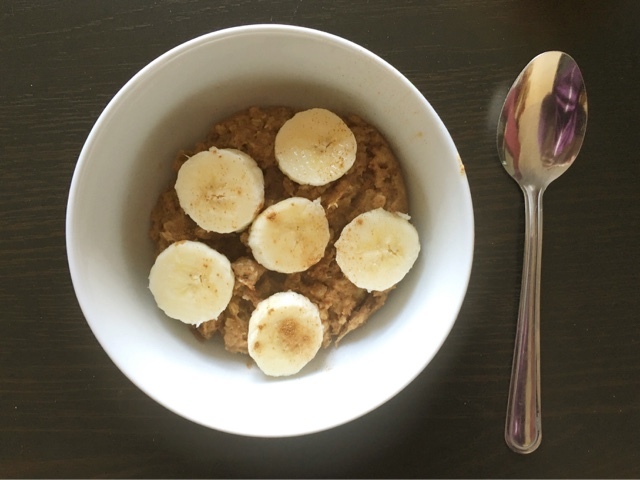 The recipe that I picked was Almond Banana Oatmeal and honestly it is one of the simplest (and tastiest) recipes I have ever tried. 001) Mash half of the banana into a saucepan. 002) Whisk almond milk, almond extract, cinnamon and salt. Add in the almond butter and stir. 003) Bring to the boil and add in oats into the mixture. 004) Reduce heat to medium and simmer for 5-7 minutes until oats are soft. 005) Chop the remaining banana into slices and top your oatmeal with it. 006) Sprinkle cinnamon (if required) and enjoy! Let me know what you think of this recipe in the comments.